AF and heart failure with reduced ejection fraction (HFrEF) frequently coexist. Catheter ablation is an increasingly utilised treatment strategy for patients with AF and can be safely performed and is effective in achieving sinus rhythm for patients with HFrEF. Successful ablation may result in improved LV function, clinical heart failure status, quality of life and possibly even mortality. This review summarises the literature analysing efficacy, safety and outcomes of AF ablation for patients with HFrEF. There have been numerous retrospective observational studies examining outcomes of catheter ablation for AF in patients with HFrEF.27–47 Although most these studies are single-centre experiences with relatively small (<100 patients) sample sizes, ablation has been shown to be relatively safe in patients with HFrEF and successful ablation has in general been associated with improved LVEF, improved quality of life and functional capacity.27 Table 1 summarises the findings of these observational studies. Most randomised controlled trials have demonstrated overall benefit with ablation.48–53 However, there has been one notable exception: a study by MacDonald et al. published in 2011 randomised 41 patients with persistent AF and HFrEF (LVEF <35 %, NYHA class II–IV) to AF ablation versus medical therapy and found no difference in LVEF improvement, N-terminal pro-brain natriuretic peptide level, 6-minute walk distance or quality of life.54 Importantly, in this study, only 50 % of patients remained in sinus rhythm at 6 months and there was a 15 % complication rate in the ablation group. Jones et al. randomised 52 patients with LVEF ≤35 % and persistent AF to ablation versus rate control.49 Overall, 88 % of patients in the ablation group were in sinus rhythm at the end of the study (68 % single procedure success). The primary endpoint of peak oxygen consumption was significantly higher in the ablation group. Furthermore, significant improvements in Minnesota score and B-type natriuretic peptide (BNP) level were seen in the ablation group as well as a non-significant trend towards benefit in 6-minute walk distance and LVEF.49 In the Catheter Ablation versus Medical Treatment of Atrial Fibrillation in Heart Failure (CAMTAF) trial, Hunter et al. randomised 50 patients with persistent AF and LVEF <50 % to ablation versus rate control. 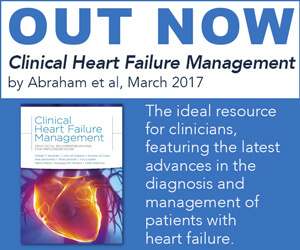 At 6 months, those randomised to ablation had 81 % freedom from recurrent AF off AADs and improved LVEF, peak oxygen consumption and Minnesota score compared with the rate control arm.50 in the Ablation versus Amiodarone for Treatment of Persistent Atrial Fibrillation in Patients with Congestive Heart Failure and an Implanted Device (AATAC) trial, Di Biase et al. randomised 203 patients with persistent AF, dual-chamber or biventricular implantable cardioverter defibrillator (ICD) and HFrEF (LVEF ≤40 % and NYHA class II–III) to ablation versus amiodarone.51 The primary endpoint was AF recurrence and secondary endpoints were all-cause mortality and unplanned hospitalisations. Despite a wide range of single-procedure success rates between centres (29–61 %), those randomised to ablation were more likely to be in sinus rhythm after single and multiple procedures. Over 2 years of follow-up, the ablation group had lower rates of hospitalisation (31 versus 57 %, p<0.001) and mortality (8 versus 18 %, p=0.037) compared with those randomised to amiodarone.51 In the Catheter Ablation versus Medical Rate Control in Atrial Fibrillation and Systolic Dysfunction (CAMERA-MRI) trial, Prabhu et al. randomised 68 patients with persistent AF and LVEF ≤45 % to ablation versus rate control and found that the ablation group were more likely to have improved LVEF.52 They also demonstrated that absence of late gadolineium enhancement on pre-procedural MRI predicted greater improvement in LVEF and normalisation of LVEF at 6 months. Catheter Ablation versus Standard Conventional Treatment in Patients with Left Ventricular Dysfunction and Atrial Fibrillation (CASTLE-AF) is the most recent randomised controlled trial, where patients with paroxysmal or persistent AF and HFrEF (<35 %) and ICD (with home monitoring capability) were randomised to either ablation or conventional medical therapy for AF.55 The primary endpoint was a composite of all-cause mortality and unplanned hospitalisation for worsening HF. Over median follow-up of 37.8 months, those randomised to ablation were significantly less likely to experience the composite primary endpoint (28.5 % versus 44.6; HR 0.62, 95 % CI [0.43–0.87]; p=0.007) than controls. Those in the ablation group were also less likely to meet the secondary endpoints of all-cause mortality (13.4 % versus 25 %; HR 0.53, 95 % CI [0.32–0.86]; p=0.011) or HF hospitalisation (20.7 % versus 35.9 %; HR 0.56, 95 % CI [0.37–0.83]; p=0.004) than controls. 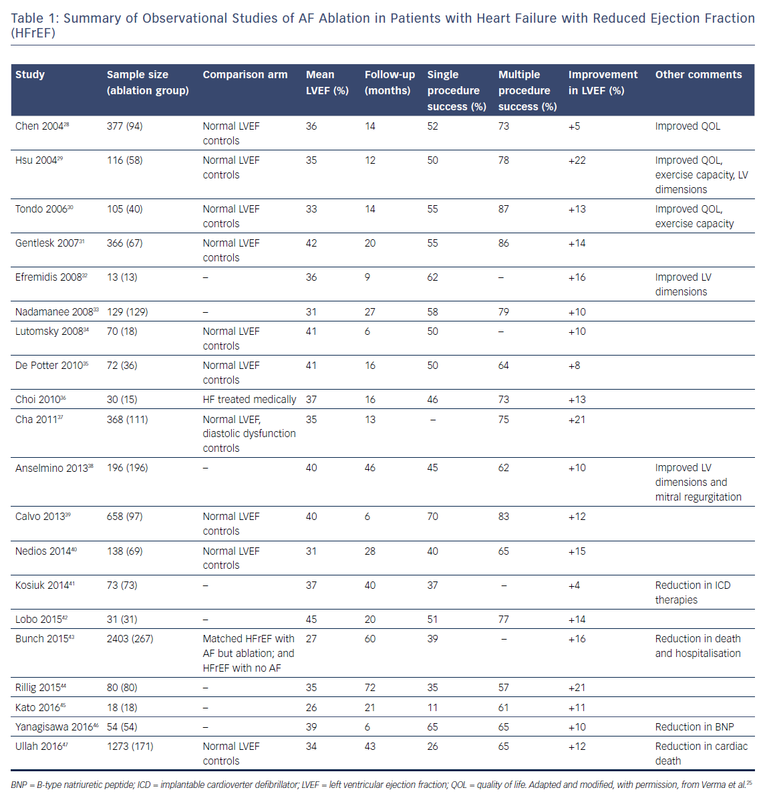 Table 2 summarises the major randomised controlled trials comparing catheter ablation with medical therapy. A number of meta-analyses have examined the benefit, efficacy and safety of catheter ablation for patients with HFrEF, all of which have suggested AF ablation to be safe, effective and beneficial in this patient population.56–59 Anselmino et al. pooled data for 1,838 patients from 26 studies (randomised controlled trials, clinical trials and observational studies) and found that over mean follow-up of 23 months, there was a 4.2 % complication rate and 60 % of patients maintained sinus rhythm over long-term follow-up.56 AF ablation resulted in significant improvement in LVEF (13 %) and reduction in BNP (620 pg/ml). Wilton et al. included eight studies of 1,851 patients in their meta-analysis comparing efficacy and safety of AF ablation in patients with reduced verses normal left ventricular systolic function.57 Freedom from recurrent AF after a single procedure was achieved in 28–55 % of patients with HFrEF; although allowing for multiple procedures, this number increased to 64–96 % (mean 1.4 procedures). There was no difference in rates of complications between groups and there was an 11 % improvement in LVEF in patients in the HFrEF group after AF ablation. Significant interplay exists between AF and HFrEF. Catheter ablation can be safely performed and is effective in maintaining sinus rhythm in patients with HFrEF, although multiple ablations may be necessary to achieve long-term freedom from AF. Successful ablation may result in improved LV function, clinical heart failure status and quality of life, as evidenced by lower BNP levels and improved peak oxygen consumption, Minnesota score and 6-minute walk distance. As such, AF ablation should be considered as an adjunctive treatment strategy for patients with HFrEF. Chamberlain AM, Redfield MM, Alonso A, et al. Atrial fibrillation and mortality in heart failure: a community study. Circ Heart Fail 2011;4:740–6. Daoud EG, Weiss R, Bahu M, et al. Effect of an irregular ventricular rhythm on cardiac output. Am J Cardiol 1996;78:1433–6. Martin CA, Lambiase PD. Pathophysiology, diagnosis and treatment of tachycardiomyopathy. Heart 2017;103:1543–52. Liang JJ, Silvestry FE. Mechanistic insights into mitral regurgitation due to atrial fibrillation: “Atrial functional mitral regurgitation”. Trends Cardiovasc Med 2016;26:681–9. Gertz ZM, Raina A, Saghy L, et al. Evidence of atrial functional mitral regurgitation due to atrial fibrillation: reversal with arrhythmia control. J Am Coll Cardiol 2011;58:1474–81. McMurray JJ, Ezekowitz JA, Lewis BS, et al. Left ventricular systolic dysfunction, heart failure, and the risk of stroke and systemic embolism in patients with atrial fibrillation: insights from the ARISTOTLE trial. Circ Heart Fail 2013;6:451–60. January CT, Wann LS, Alpert JS, et al. 2014 AHA/ACC/HRS guideline for the management of patients with atrial fibrillation: executive summary: a report of the American College of Cardiology/American Heart Association Task Force on practice guidelines and the Heart Rhythm Society. Circulation 2014;130:2071–104. Rienstra M, Damman K, Mulder BA, et al. Beta-blockers and outcome in heart failure and atrial fibrillation: a meta-analysis. JACC Heart Fail 2013;1:21–8. Cullington D, Goode KM, Zhang J, et al. Is heart rate important for patients with heart failure in atrial fibrillation? JACC Heart Fail 2014;2:213–20. Kotecha D, Flather MD, Altman DG, et al. Heart rate and rhythm and the benefit of beta-blockers in patients with heart failure. J Am Coll Cardiol 2017;69:2885–96. Kotecha D, Holmes J, Krum H, et al. Efficacy of beta blockers in patients with heart failure plus atrial fibrillation: an individual-patient data meta-analysis. Lancet 2014;384:2235–43. Kober L, Torp-Pedersen C, McMurray JJ, et al. Increased mortality after dronedarone therapy for severe heart failure. N Engl J Med 2008;358:2678–87. Torp-Pedersen C, Møller M, Bloch-Thomsen PE, et al. Dofetilide in patients with congestive heart failure and left ventricular dysfunction. N Engl J Med 1999;341:857–65. Brendorp B, Elming H, Jun L, et al. QTc interval as a guide to select those patients with congestive heart failure and reduced left ventricular systolic function who will benefit from antiarrhythmic treatment with dofetilide. Circulation 2001;103:1422–7. Freemantle N, Lafuente-Lafuente C, Mitchell S, et al. Mixed treatment comparison of dronedarone, amiodarone, sotalol, flecainide, and propafenone, for the management of atrial fibrillation. Europace 2011;13:329–45. Packer DL, Prutkin JM, Hellkamp AS, et al. Impact of implantable cardioverter-defibrillator, amiodarone, and placebo on the mode of death in stable patients with heart failure: analysis from the sudden cardiac death in heart failure trial. Circulation 2009;120:2170–6. Roy D, Talajic M, Nattel S, et al. Rhythm control versus rate control for atrial fibrillation and heart failure. N Engl J Med 2008;358:2667–77. Pedersen OD, Bagger H, Keller N, et al. Efficacy of dofetilide in the treatment of atrial fibrillation-flutter in patients with reduced left ventricular function: a Danish Investigations of Arrhythmia and Mortality ON Dofetilide (DIAMOND) substudy. Circulation 2001;104:292–296. Njoku A, Kannabhiran M, Arora R, et al. Left atrial volume predicts atrial fibrillation recurrence after radiofrequency ablation: a meta-analysis. Europace 2018;20:33–42. Calkins H, Hindricks G, Cappato R, et al. 2017 HRS/EHRA/ECAS/APHRS/SOLAECE expert consensus statement on catheter and surgical ablation of atrial fibrillation. Heart Rhythm 2017;14:e275–e444. Verma A, Jiang CY, Betts TR, et al. Approaches to catheter ablation for persistent atrial fibrillation. N Engl J Med 2015;372:1812–22. Dixit S, Marchlinski FE, Lin D, et al. Randomized ablation strategies for the treatment of persistent atrial fibrillation: RASTA study. Circ Arrhythm Electrophysiol 2012;5:287–94. Verma A, Kalman JM, Callans DJ. Treatment of patients with atrial fibrillation and heart failure with reduced ejection fraction. Circulation 2017;135:1547–63. Chen MS, Marrouche NF, Khaykin Y, et al. Pulmonary vein isolation for the treatment of atrial fibrillation in patients with impaired systolic function. J Am Coll Cardiol 2004;43:1004–9. Hsu LF, Jais P, Sanders P, et al. Catheter ablation for atrial fibrillation in congestive heart failure. N Engl J Med 2004;351:2373–83. Tondo C, Mantica M, Russo G, et al. 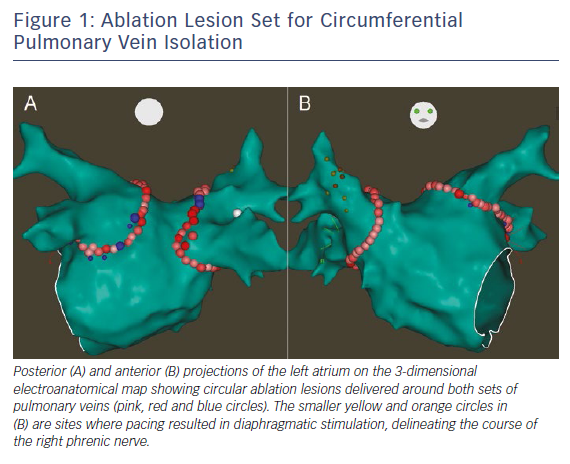 Pulmonary vein vestibule ablation for the control of atrial fibrillation in patients with impaired left ventricular function. Pacing Clin Electrophysiol 2006;29:962–70. Gentlesk PJ, Sauer WH, Gerstenfeld EP, et al. Reversal of left ventricular dysfunction following ablation of atrial fibrillation. J Cardiovasc Electrophysiol 2007;18:9–14. Efremidis M, Sideris A, Xydonas S, et al. Ablation of atrial fibrillation in patients with heart failure: reversal of atrial and ventricular remodelling. Hellenic J Cardiol 2008;49:19–25. Nademanee K, Schwab MC, Kosar EM, et al. Clinical outcomes of catheter substrate ablation for high-risk patients with atrial fibrillation. J Am Coll Cardiol 2008;51:843–9. Lutomsky BA, Rostock T, Koops A, et al. Catheter ablation of paroxysmal atrial fibrillation improves cardiac function: a prospective study on the impact of atrial fibrillation ablation on left ventricular function assessed by magnetic resonance imaging. Europace 2008;10:593–9. De Potter T, Berruezo A, Mont L, et al. Left ventricular systolic dysfunction by itself does not influence outcome of atrial fibrillation ablation. Europace 2010;12:24–9. Choi AD, Hematpour K, Kukin M, et al. Ablation vs medical therapy in the setting of symptomatic atrial fibrillation and left ventricular dysfunction. Congest Heart Fail 2010;16:10–4. Cha YM, Wokhlu A, Asirvatham SJ, et al. Success of ablation for atrial fibrillation in isolated left ventricular diastolic dysfunction: a comparison to systolic dysfunction and normal ventricular function. Circ Arrhythm Electrophysiol 2011;4:724–32. Anselmino M, Grossi S, Scaglione M et al. Long-term results of transcatheter atrial fibrillation ablation in patients with impaired left ventricular systolic function. J Cardiovasc Electrophysiol 2013;24:24–32. Calvo N, Bisbal F, Guiu E, et al. Impact of atrial fibrillation-induced tachycardiomyopathy in patients undergoing pulmonary vein isolation. Int J Cardiol 2013;168:4093–7. Nedios S, Sommer P, Dagres N, et al. Long-term follow-up after atrial fibrillation ablation in patients with impaired left ventricular systolic function: the importance of rhythm and rate control. Heart Rhythm 2014;11:344–51. Kosiuk J, Nedios S, Darma A, et al. Impact of single atrial fibrillation catheter ablation on implantable cardioverter defibrillator therapies in patients with ischaemic and non-ischaemic cardiomyopathies. Europace 2014;16:1322–6. Lobo TJ, Pachon CT, Pachon JC, et al. Atrial fibrillation ablation in systolic dysfunction: clinical and echocardiographic outcomes. Arq Bras Cardiol 2015;104:45–52. Bunch TJ, May HT, Bair TL, et al. Five-year outcomes of catheter ablation in patients with atrial fibrillation and left ventricular systolic dysfunction. J Cardiovasc Electrophysiol 2015;26:363–70. Rillig A, Makimoto H, Wegner J, et al. Six-year clinical outcomes after catheter ablation of atrial fibrillation in patients with impaired left ventricular function. J Cardiovasc Electrophysiol 2015. Kato K, Ejima K, Fukushima N, et al. Catheter ablation of atrial fibrillation in patients with severely impaired left ventricular systolic function. Heart Vessels 2016;31:584–92. Yanagisawa S, Inden Y, Kato H, et al. Decrease in B-type natriuretic peptide levels and successful catheter ablation for atrial fibrillation in patients with heart failure. Pacing Clin Electrophysiol 2016;39:225–34. Ullah W, Ling LH, Prabhu S, et al. Catheter ablation of atrial fibrillation in patients with heart failure: impact of maintaining sinus rhythm on heart failure status and long-term rates of stroke and death. Europace 2016;18:679–86. Khan MN, Jais P, Cummings J, et al. Pulmonary-vein isolation for atrial fibrillation in patients with heart failure. N Engl J Med 2008;359:1778–85. Jones DG, Haldar SK, Hussain W, et al. A randomized trial to assess catheter ablation versus rate control in the management of persistent atrial fibrillation in heart failure. J Am Coll Cardiol 2013;61:1894–903. Hunter RJ, Berriman TJ, Diab I, et al. A randomized controlled trial of catheter ablation versus medical treatment of atrial fibrillation in heart failure (the CAMTAF trial). Circ Arrhythm Electrophysiol 2014;7:31–8. Di Biase L, Mohanty P, Mohanty S, et al. 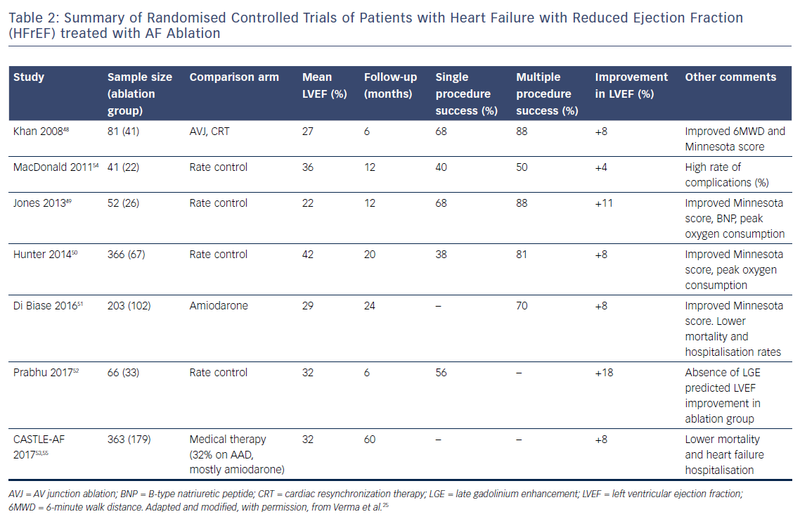 Ablation versus amiodarone for treatment of persistent atrial fibrillation in patients with congestive heart failure and an implanted device: results from the AATAC Multicenter Randomized Trial. Circulation 2016;133:1637–44. Prabhu S, Taylor AJ, Costello BT, et al. Catheter ablation versus medical rate control in atrial fibrillation and systolic dysfunction: the CAMERA-MRI Study. J Am Coll Cardiol 2017;70:1949–61. Catheter Ablation vs. Standard Conventional Treatment in Patients With LV Dysfunction and AF (CASTLE-AF). https://clinicaltrials.gov/show/NCT00643188 (Accessed 13 January 2018). MacDonald MR, Connelly DT, Hawkins NM, et al. Radiofrequency ablation for persistent atrial fibrillation in patients with advanced heart failure and severe left ventricular systolic dysfunction: a randomised controlled trial. Heart 2011;97:740–7. Marrouche NF, Brachmann J, Andresen D, et al. Catheter ablation for atrial fibrillation with heart failure. N Engl J Med 2018;378:417–27. Anselmino M, Matta M, D’Ascenzo F, et al. Catheter ablation of atrial fibrillation in patients with left ventricular systolic dysfunction: a systematic review and meta-analysis. Circ Arrhythm Electrophysiol 2014;7:1011–8. Wilton SB, Fundytus A, Ghali WA, et al. Meta-analysis of the effectiveness and safety of catheter ablation of atrial fibrillation in patients with versus without left ventricular systolic dysfunction. Am J Cardiol 2010;106:1284–91. Dagres N, Varounis C, Gaspar T, et al. Catheter ablation for atrial fibrillation in patients with left ventricular systolic dysfunction. A systematic review and meta-analysis. J Card Fail 2011;17:964–70. Ganesan AN, Nandal S, Luker J, et al. 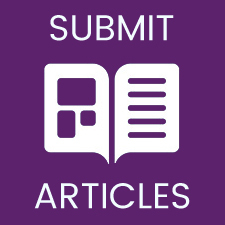 Catheter ablation of atrial fibrillation in patients with concomitant left ventricular impairment: a systematic review of efficacy and effect on ejection fraction. Heart Lung Circ 2015;24:270–80.